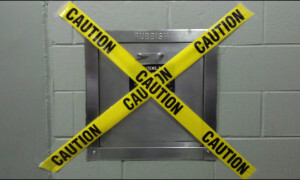 Earlier in the fall the Association replaced the garbage chute from the 46th to 49th floors, due to leaks that came from around the chute. After this work was completed, some minor leaking continued in certain locations. We further studied and tested the areas near the leaking and above and below the floors where the chute was replaced. Joints within the chute were found to be deteriorating and further investigation yielded more areas of relatively serious deterioration and penetrations likely causing the leaks. Our team was also very concerned more leaking would be just around the corner. At the October 13th Board of Directors meeting, the Board considered these findings and approved the replacement of the remainder of the chute from the 19th floor to the roof. (The 18th Floor to the garbage room was replaced about 5 years ago.) Since that time, the chute has been manufactured and the contractors advised us they are ready to begin the work. We realize everyone must a bit weary from the project out front, window washing, power washing, etc… So we asked for them to begin this work after the holidays. Opening of the walls and demolition is expected to begin from the 19th floor working upward, at about 3 to 4 floors per day, starting on Monday January 5th. Assuming we have no surprises, they expect to be able to complete the bulk of the work in about 3 weeks. While work is going on below your floor, the garbage chute will be closed. The staff will post signs, and remove the chute handles to help protect the workers while they are working. Bins will be placed in the service area, which will be checked regularly. WE NEED YOUR HELP DURING THIS PROCESS – We request any garbage containing perishables or unpleasant odors, be taken all the way out to the back dumpster. Anyone that needs assistance, can feel free to contact the office or front desk (773-769-3250 or 773-769-3083 respectively), to arrange for help. ALSO, if you observe that the bins are full or stinky, please let us know right away and we will have our team respond as quickly as possible. As always, we greatly appreciate Owners and residents patience while repairs are being made. If you have any questions or concerns, please send the office an e-mail.